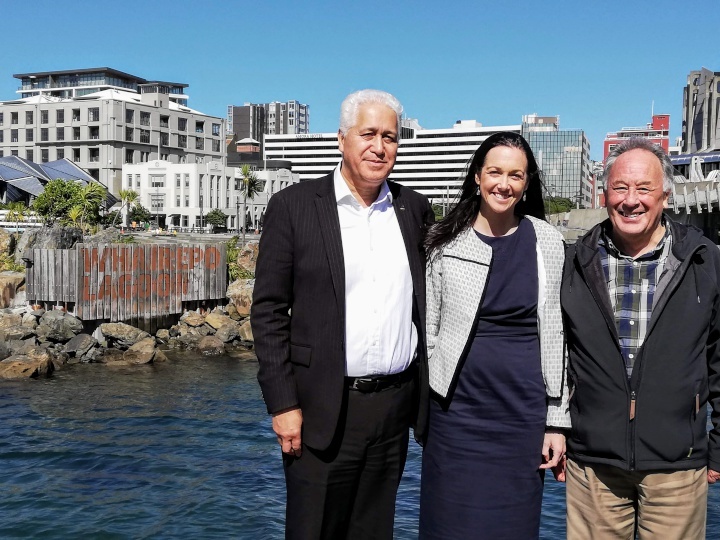 Confusion about the name of Wellington’s waterfront lagoon will be no more, with Whairepo Lagoon now etched into the landscape. The man-made landmark by Frank Kitts Park was officially named Whairepo Lagoon in 2015, but the name is not widely known. Deputy Mayor Jill Day is excited to see the name permanently recognised. “Our new te reo Māori policy, Te Tauihu, is not just about new ideas, events and names, but about acknowledging the past and the existing Māori contributions in our city. The new sign was installed using existing features to ensure the character of the area was retained. The name has been etched into wooden planks in the garden near The Boatshed and is easily seen from the north side of the lagoon. “Our waterfront is unique in that it doesn’t have much overt signage. We wanted to respect that, but also find a way to help people know the special name of our lagoon,” the Deputy Mayor says. The name Whairepo was submitted to the New Zealand Geographic Board by mana whenua Taranaki Whānui, after being given by kaumātua Sam Jackson. His son, Port Nicholson Block Settlement Trust Deputy Chairman Peter Jackson, says his father would have been proud to see the work that has been done to acknowledge the name. Wellington Tenths Trust Chairman Morrie Love said the name was poetically appropriate for the area. • The lagoon was officially named by the New Zealand Geographic Board in December 2015. • Whairepo refers to the Australasian eagle rays that swim in the lagoon in the warmer months. • The word Whairepo are said to derive from whai – ray and repo – mudflat. • The whairepo can be seen from the City to Sea Bridge as silhouettes as they swim through the water and careful viewers can spot them sunning themselves near the rocks.